There are 90 apartments in total, in 12 buildings of just 3 storeys, with no more than three apartments per level. The project showcases the unique vision by merging the latest word in design into idyllic natural surroundings to create a beautiful, exclusive, mountainside 12-building enclave of low-level 2 and 3 bedroom apartments with manicured gardens and pool areas. There are 2 or 3 bedrooms, the latter with an extra toilet. Experience the security and familiarity of a peaceful, self-contained community in the lovely rural setting of Marbella-Benahavís, with its restaurants and spectacular scenery. But enjoy having the diverse cultural and social charms of Marbella and Puerto Banús on your doorstep. Our privileged location next to the UNESCO biosphere reserve gives you the freedom to enjoy your personal version of the outdoor lifestyle, from hiking and horse riding to simply enjoying the fabulous views. Communal gardens include swimming pools for adults and children and a range of areas to enjoy the sun or shade. The ground floor apartments have private gardens, giving them the feel of living in a villa. Each apartment has an assigned parking space in the garage and a secure private storeroom (3 Bedrooms apartments has 2 garage). Carefully considered lighting systems and oversized 2.40m. internal doors to enhance the feeling of space. Designer kitchen with high and low large capacity cupboards. Composite worktop. • Fully equipped kitchen. Unit per apartment with heat pump (cold-heat). Independent zone control will be installed with motorized grilles and Airzone system or similar to move the air. Installation of solar energy for the production of hot water. Video intercom with exterior and interior opening system in dwelling. Fireplace pre-installation in living room. 2 Bedrooms apartments from 470.000 € (116 Sq.M built + 50 Sq.M terrace). 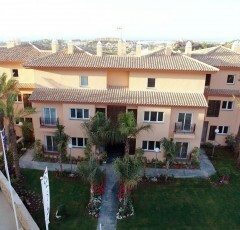 2 Bedrooms apartments from 490.000 € (116 Sq.M built + 78 Sq.M garden). 3 Bedrooms apartments from 580.000 € (150 Sq.M built + 68 Sq.M terrace).